I have been resisting the temptation to make these Pakodas for a long time . Last week rain brings with it cravings for hot,spicy,fried food. 1. 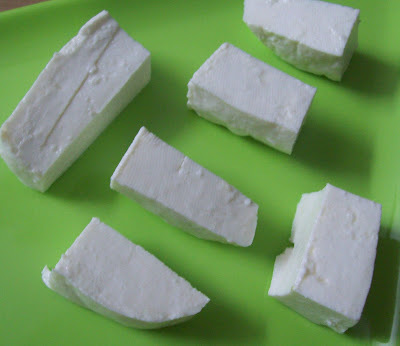 Cut the paneer into rectangle pieces. 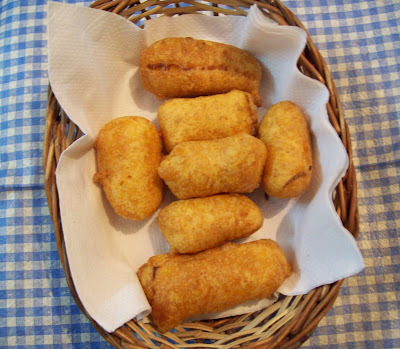 2.Mix gram flour, rice flour, salt and red chilli powder with water to get a thick batter. 3. Mix all the ingredients for the marinade and put the paneer pieces in it. Mix delicately, taking care not to break the pieces. 4.Coat all the pieces with the marinade and keep aside for about 20 mins. 5. Heat oil in a wok/ Kadai. Check the temperature by putting a drop of the batter in it. It should immediately rise and sizzle. 6. Dip the paneer pieces in this batter and fry them in hot oil till golden brown. 7.Serve the paneer pakoda hot with coriander or mint chutney hot. Sending this to WYF:Salads/Starters/Soups hosted by EC. Tasy looking pakodas. Love them. It has been a long time I made them. Nice to know ur feeling better...regarding panner pakodas i make this rarely at home...ur looks tempting and divine..
And what a recipe to be back with... fried goodies! Good to see you back Jaishree:). Chunky paneer pakodas surely are filling snacks. nice to know that u r ok now! pakodas are looking so delicios and inviting! I too hav been thinking to give this pakoda a try for long tim...Urs looks perfect! Oh dear,didn't know about the viral.Glad you better now.Take care. these pakodas wer very crispy n mouth waterin...pls make it one more tym for me amma....!!! :)lots of love..!! Looks so tempting......I'm a fan of paneer and my daughter loves it too. This is the first time I'm visiting your blog and i must say its very nice.